Launched thirty years ago, the Psion Organiser II is arguably the world's first commercially successful PDA. Combining a usable set of applications with an expandable software and hardware platform, the Organiser II shifted half a million units in its lifetime and introduced the power of handheld computing to both companies and individuals alike. By modern standards the Organiser II has a familiar feel to it, with a footprint similar to a large smartphone such as an iPhone 6, although about 50% heavier and more than three times thicker. The front of the Organiser was almost entirely taken up with a keyboard (with the keys arranged alphabetically) with a small two-line LCD on the top. Inside was a Hitachi CPU clocked at a little under 1MHz and power was provided by a tradition 9 volt PP9 battery which could run the Organiser II for months. There were a variety of data storage options, from simple RAM modules that would lose data when the battery was removed to "write once" programmable ROM packs (which had to be erased with ultraviolet light) and later EEPROM packs. Hardware expansion included a serial module which allowed you to transfer data to another computer system. It didn't take long for corporations to adapt the Organiser II to allow them to collect data "in the field" which could then be uploaded to corporate mainframes. You could program your own applications, or you could use the inbuilt diary and calculator to organise yourself. Third-party applications became available, and there was even a rudimentary word processor. As you might guess, this wasn't the first Psion Organiser, but it was a huge improvement over the original launched two years earlier. 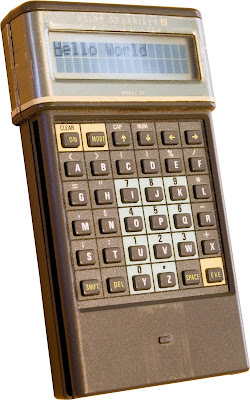 And although Casio and Sharp had been making pocket computers for some time, the Organiser II is acknowledged by many as being the first usable personal digital organiser. The Psion Organiser II was followed by more powerful PDAs running the EPOC operating system, which eventually evolved into Symbian. Because of the large number sold and the almost legendary reliability of these devices, there are plenty of Organiser IIs on the market today, with prices ranging from a few pounds to just shy of £100 depending on condition and features. And unlike a lot of vintage devices, the Organiser II is something that you can still use today to keep yourself.. organised.